The best recipe for mixing henna for hair, plus making a henna gloss for in between conditioning. Mix BAQ henna powder with lukewarm water until you get a consistency or pancake batter. Leave the henna on your hair for 2-4 hours. The longer you leave the henna on the hair, the richer the color. You can leave the henna on for longer and not harm your hair or skin. You can even leave the henna on overnight for really rich color. Rinse the henna out of your hair. This is not the easiest task and will take forever if you have long or curly hair. 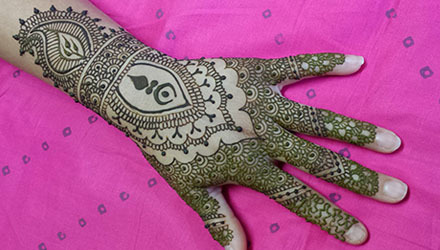 You can add scent to your henna by adding rose water or essential oils to the henna. If you add essential oil, only add a couple of drops or you WILL get a headache.